An urban mansion is coming to northern Tribeca. At five stories and nearly 20,000 square feet (including the basement), the family of five’s proposed home at 11 Hubert St. would rise 70 feet at the corner of Collister Street. Clad in metal, glass and limestone, it would be two stories taller and far showier than the plain stucco, mixed-use structure that it will be built upon. The floor plans call for 11 bathrooms, five bedrooms (including two guest rooms), a dog room, separate prep and catering kitchens, wine closet and two bars, screening room, his-and-her studies, fully landscaped courtyard, 5,000-square-foot sports and fitness center in the basement, and a garage. The roof would be topped by a curvy trellis of solar panels. Located in the Tribeca North Historic District, the building still needs the approval of the Landmarks Preservation Commission. Last week, Bialosky presented the plans to Community Board 1’s Landmarks Committee, which is advisory to the Landmarks Commission. 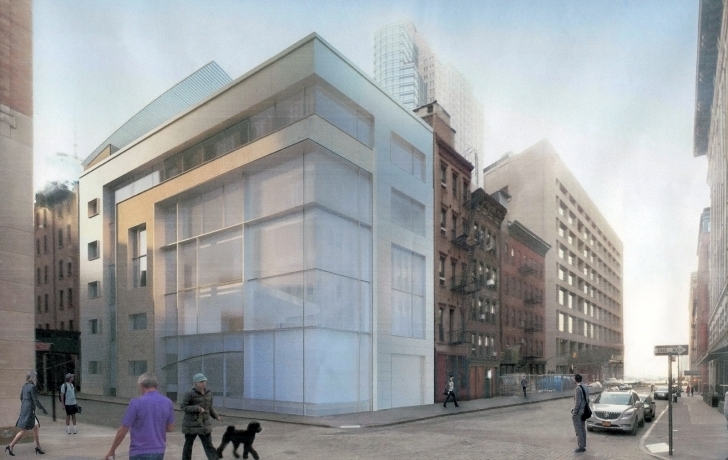 Most of the members said they liked the building’s design, but were less than enthusiastic about seeing it in Tribeca. In a telephone interview later, Bialosky insisted that the new home does fit into the neighborhood, and blamed himself for failing to convince the committee of it. Bialosky said that on the next go-round he will adjust the building’s height, or possibly make it look less tall by the use of different materials. But he remains loyal to the modern design.